For the last several weeks I have been enjoying just how beautiful life can be. 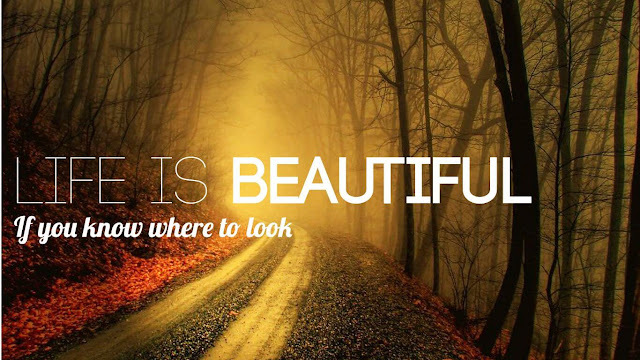 There is so much beauty around us each and everyday if you just become aware of it. I thought I've a song I heard called Life is Beautiful by Vega4. (from the movie My Sisters Keeper) One of the lines in the last part of the song says,"I will hold you tightly, when the hurting kicks in....Life is Beautiful, but its complicated, we barely make it. We don't need to understand, there are miracles." Something just ignited inside my soul when I heard that. If you are like me you may always want to understand why everything happens and how everything ties together and resolves. However, if we knew it all we wouldn't need faith. Where's the fun in that? We don't need to understand how it all fits together! We just need to know the One who fits it together! Scripture tells us that ALL things are mixed and mingled together for our good if we love Him. Part of that process if to love yourself. When was the last time you got up, looked in the mirror and told yourself how beautiful you were? That's not arrogance, that is telling God that you are thrilled with what He created! OK, life is complicated and sometimes it feels like you barely make it...but the truth is YOU WILL MAKE IT! Don't put a period where God has placed a comma. Keep pressing on. You don't need to understand. There ARE miracles for you and your family! Life is Beautiful and SO ARE YOU!